Stretch to the size of your calling? Find your way to speak powerfully about what you love? Let your communications reflect who you really are? Permit your authentic self to emerge in front of your audience? Trust yourself to speak well in the moment? 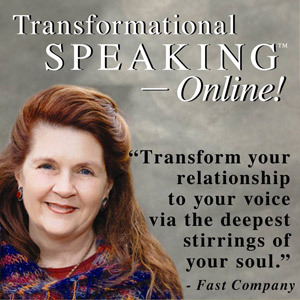 Transformational Speaking is a process that reveals the part of you that is fully capable – right now – of opening hearts, inspiring change, and moving others to act through public speaking. It’s about allowing your real self to take the stage, letting your words and presence reflect the truth of who you are. It’s about speaking with wisdom, intimacy and dynamism. It’s about your purpose here on earth. If you had only one minute to speak, what would you say? 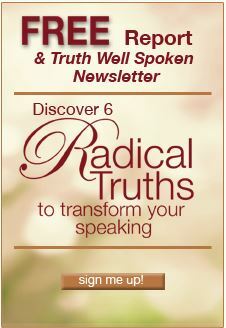 Gail Larsen knows that a compelling communicator already lives within you. Public speaking programs that impose tired techniques and pedantic formulas only obscure your natural brilliance. You don’t need to “fix” yourself—you need to find yourself. When you shift from your comfort zone to your Home Zone™, you call forth a new edge of emotional connection. Because you are connected to yourself, you connect with your audience. You set in motion the world-transforming story that your life, and your life alone, has prepared you to tell. 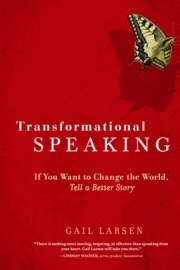 As a speaker with something only you can say, why accept anything less than life-altering transformation? Cross the bridge from resistance to resonance. Open your heart. Choose power over force. Inspire the impossible. And change the world — one audience at a time. Visit Our Client Scrapbook. Who Do You Recognize?